Background. On July 12, 2007 a US Army Apache helicopter, firing a 30-mm cannon, massacred about a dozen Iraqis and severely wounded two children on a Baghdad street. Two of the Iraqis killed were employees of the Reuters news service. Five days after the massacre the US Army produced a report exonerating itself of any violation of the rules of engagement. These rules of engagement apparently excuse the murder of any "military aged" male standing close to an Iraqi male holding a military weapon. Gun camera stills in the report showed that one Iraqi had an AK-47 and another was holding an RPG (rocket propelled grenade launcher). This posting attempts to correlate the Army report with the Wikileaks Collateral Murder video, released to the public April 5, 2010. The Wikileaks 38-minute video shows classified, unedited imagery captured by the Apache cannon camera. 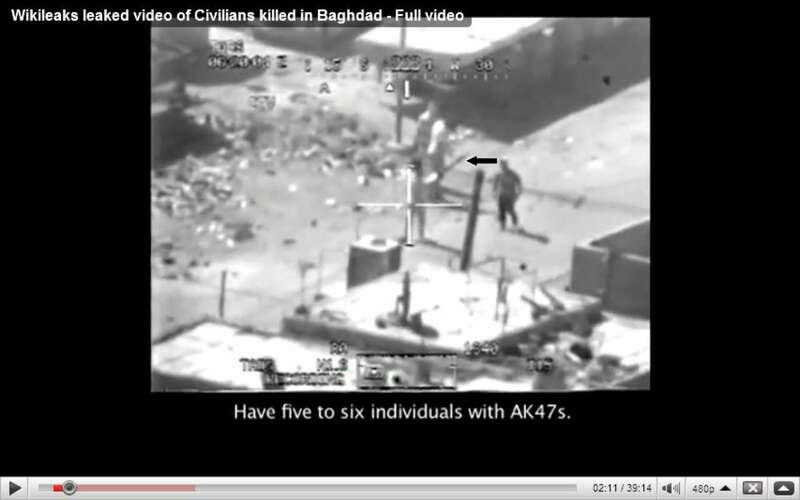 Wikileaks announced the availability of its documentary video Collateral Murder to great fanfare at a Washington, DC press conference on April 5, 2010. 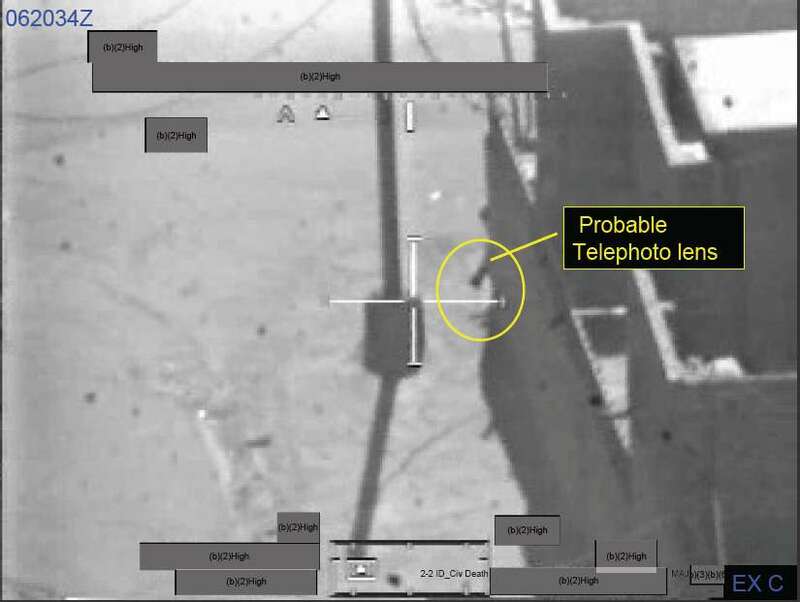 Julian Assange, founder of Wikileaks, stated that his organization had gotten a copy of the raw video from an Apache helicopter gun camera used in a Baghdad army assault on July 12, 2007. The raw footage showed the killing of two civilian employees of the Reuters news service. Reuters had unsuccessfully petitioned the US government to obtain this video. Wikileaks claimed it got an encrypted copy from a whistleblower. They did not disclose how they managed to decrypt it. There are actually two videos on the Collateral Murder site. One is a 17-minute annotated version with credits, requests for donations and considerable textual commentary about the two Reuters victims. The other, called the unedited version, is 38 minutes long and shows the complete raw video from the gun camera. 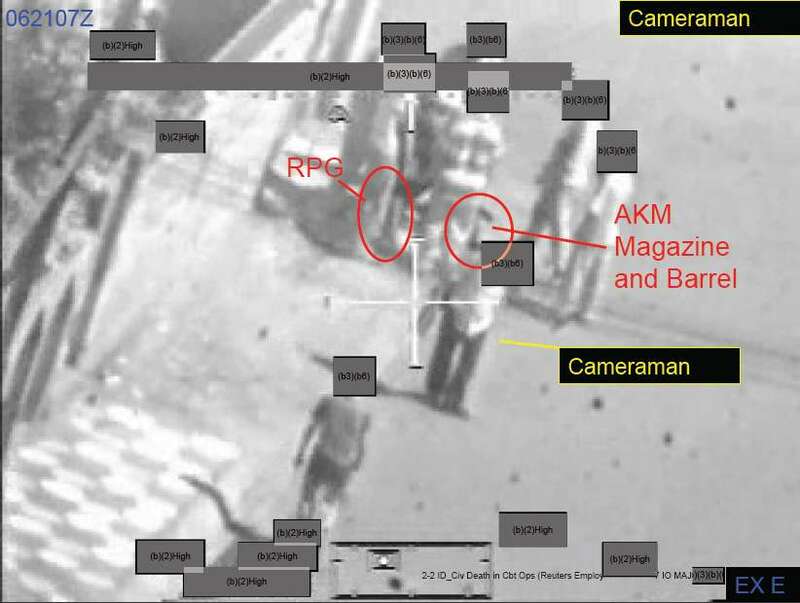 In both versions the viewer sees what the Apache gunner saw during the engagement and hears what the gunner said and heard. Both versions show transcription of voices heard over the audio network. The 17-minute version opens with scenes over Baghdad as the camera seeks out a loose group of about fifteen men walking in a street. Annotations identify the Reuters employees, Namir Noor-Eldeen and Saeed Chmagh, carrying cameras while a network voice announces, "That's a weapon." The gunner requests and gets permission to fire on the group. At one point an unidentifiable man holding a long object appears to peek around the corner of the building. A voice says, "He's got an RPG!" (rocket propelled grenade launcher). The helicopter circles around the building and the group of nine men comes back into view. The gunner opens fire with the cannon. When the dust settles, bodies are scattered all around. It appears the entire group has been killed except for one man who is trying to crawl. After a few minutes a black van drives up, a man gets out and tries to put the injured guy inside. But the helicopter opens fire again, killing the rescuer and the earlier victim and disabling the vehicle. A few minutes later a US armored vehicle arrives on the scene and US soldiers swarm the area, looking over the dead bodies and the disabled van. They announce that there are two seriously wounded children in the front seat of the van and request medical assistance. The 38-minute version shows the same footage as the edited version, sans the textual commentary and video annotations. It has additional video showing an attack on a building believed to be occupied by insurgents. Three Hellfire missiles are fired into the building. 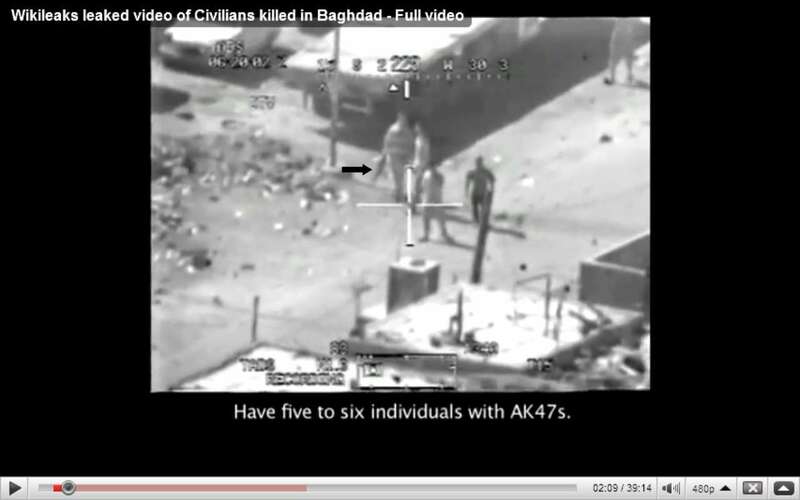 An obvious deficiency of the Collateral Murder video is that it provides no context for the massacre. It gives the impression that fifteen men, including two journalists, were out for a stroll when they were set upon by an Apache helicopter whose murderous gunner couldn't distinguish a camera from an RPG. Surprisingly, there is available online a document that gives some context to the incident and, even more surprisingly, does not contradict the (unedited) video content supplied by Wikileaks. The document is the "Investigation Into Civilian Casualties Resulting From an Engagement July 12, 2007 In the New Baghdad District of Baghdad, Iraq." This is the US Army's official report explaining the deaths of the two Reuters employees and the injuries to the two children in the van. The Army document contains (1) a memo directing an officer (all names are redacted) to investigate the engagement that resulted in the deaths of the two civilian employees of Reuters and injuries sustained by two children in the van that came under attack, (2) a five-page memo, dated July 17, 2007, giving the background of the incident and the conclusions of the investigation, and (3) a collection of exhibits A through S. The exhibits include nine annotated Apache gun camera stills, sworn statements by five soldiers who arrived on the scene immediately after the engagement, and some digital images recovered from a camera belonging to Namir Eldeen, the Reuters photographer. This passage puts the helicopter attack into the context of the military operation. The report identifies the two Reuters employees in the Apache gun video and concludes they were carrying cameras, not weapons. It also says that the long object seen at the building corner on the intersection is a "probable" telephoto lens, not an RPG. Nevertheless, the report finds that the Iraqi group that took the first burst of fire had at least one RPG and one AK-47. Before considering the video evidence further, it's useful to know what RPGs and AK-47s look like. Here's a picture of a fellow (not known to be connected with this incident!) carrying an RPG on his shoulder. Two extra grenades are in his backpack. Here's a web page that gives the specs for the RPG-7. Note that its loaded weight is between 10.1 and 12.4 kg (22 - 27 lbs). This page explains how an RPG-7 works. Below is picture of an AK-47 taken from Wikipedia. Note that its length is about 34 inches and its weight, with an unloaded magazine, is 9.5 lbs. 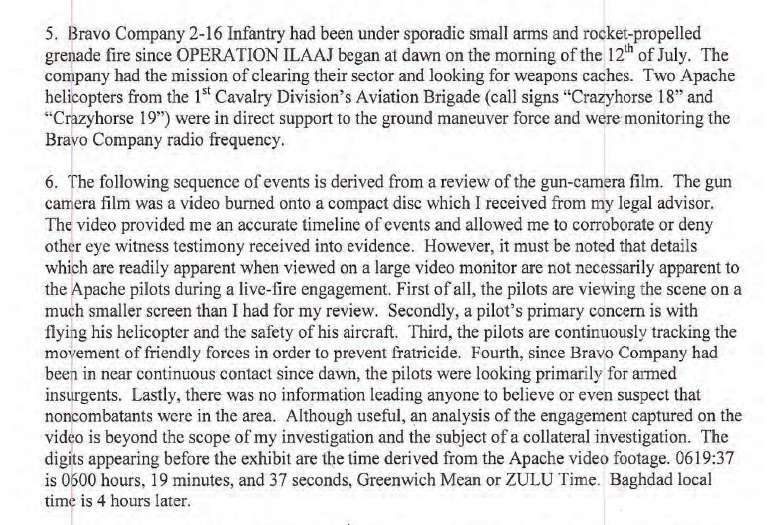 The Army memo then proceeds to examine Apache gun camera stills. The first one shows the two Reuters employees carrying "Possible" cameras with telephoto lenses. The second image, taken a few seconds later, purports to show other Iraqis carrying weapons, specifically, an RPG, an AKM (a variant of the AK-47) and an RPG round. This image isn't too clear here, but is probably clearer in the original. The image below comes from about the same point in time on the Wikileaks version (2:09). The fat guy with the horizontally-striped shirt seems to be carrying an AK-47 and swinging it as he walks. Here, two seconds later on the Wikileaks video, the skinny guy next to the fat guy turns around, swinging what looks very much like an RPG. 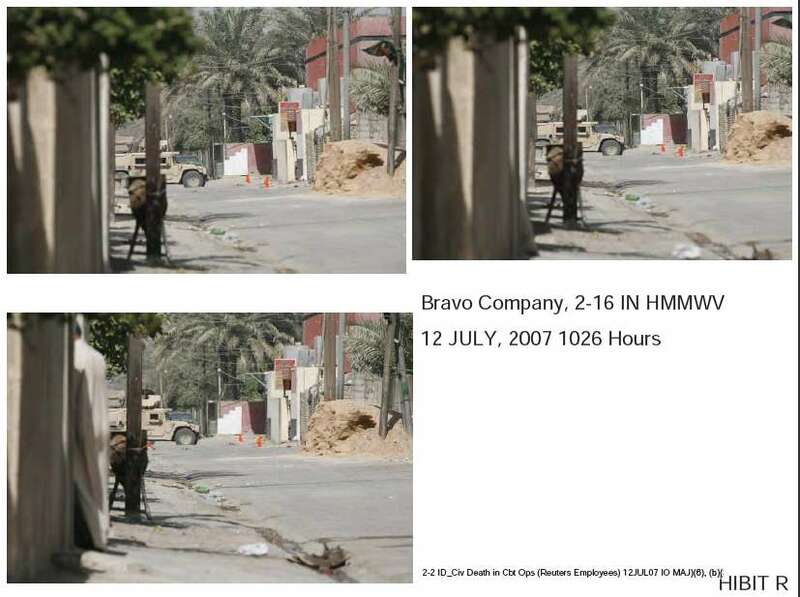 The picture below is shown to illustrate that the Army analysis believes that the guy peeking around the corner is more likely holding a telephoto lens than an RPG. 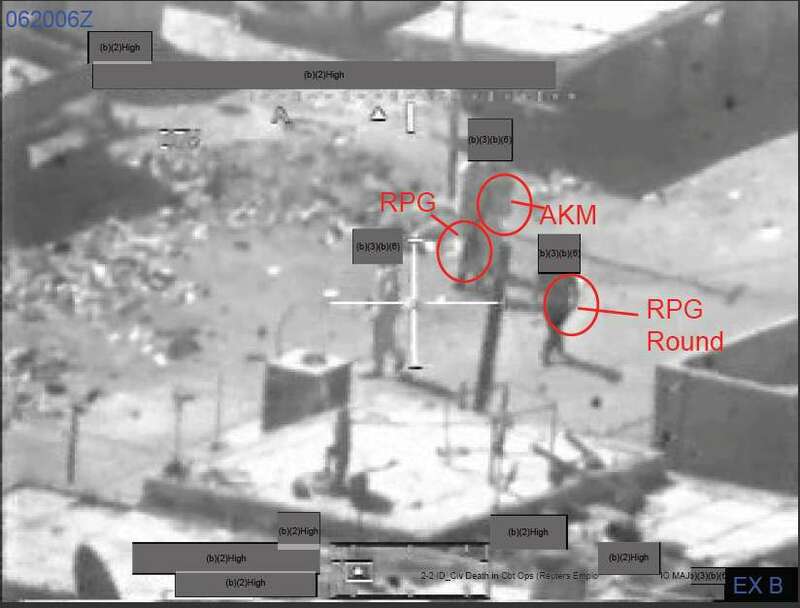 The Army report also shows three pictures taken by Namir's camera at about the same time the above image was captured by the Apache gun video. (Namir's camera was picked up by the soldiers who secured the area after the shooting.) The pictures show an Army vehicle in the intersection with the next block. That vehicle would be vulnerable to an attack by an RPG. The time stamp on the photo is 10:26. The time stamp on gun camera image is 6:20:34Z, or 10:20:34 Baghdad time. Miscalibration of the camera clock could explain the discrepancy. 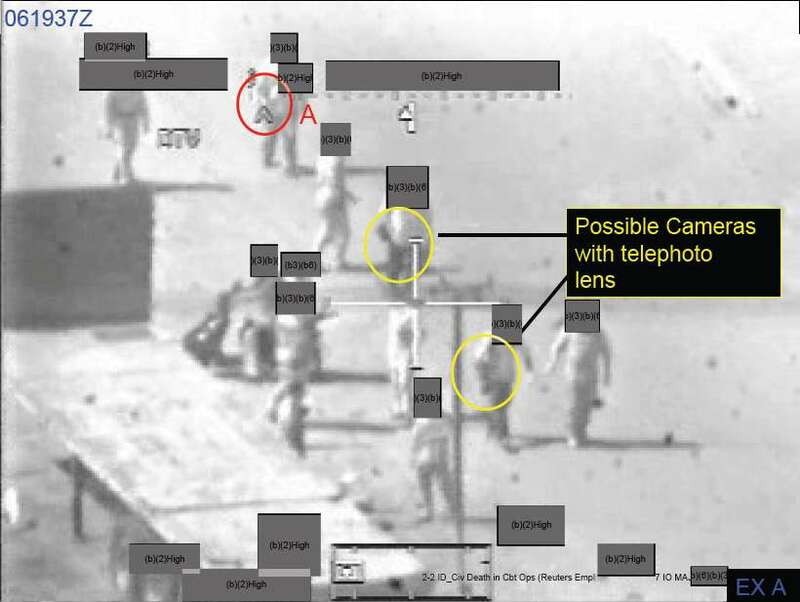 This image from the Army report shows the Iraqis gathered at the intersection, seconds before the Apache cannon fire wipes them out. The Army's analysis concluded there was an AKM and an RPG in this crowd. Here is a Wikileaks image from about that time. (Click to enlarge.) I could believe that the guy with the striped shirt is holding an AK-47. Could he be the same guy we saw earlier, swinging a rifle as he walked? The RPG is more difficult to discern. 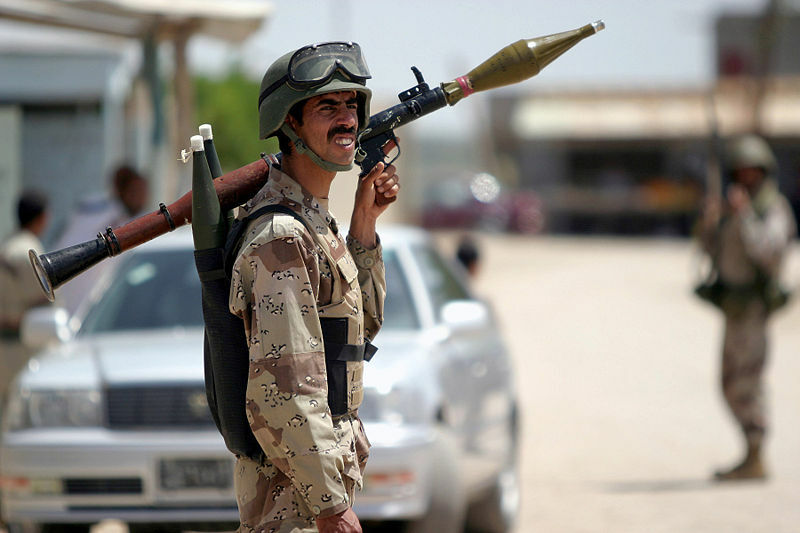 The Iraqi man allegedly holding it does resemble the skinny guy swinging an RPG earlier in the Wikileaks video. 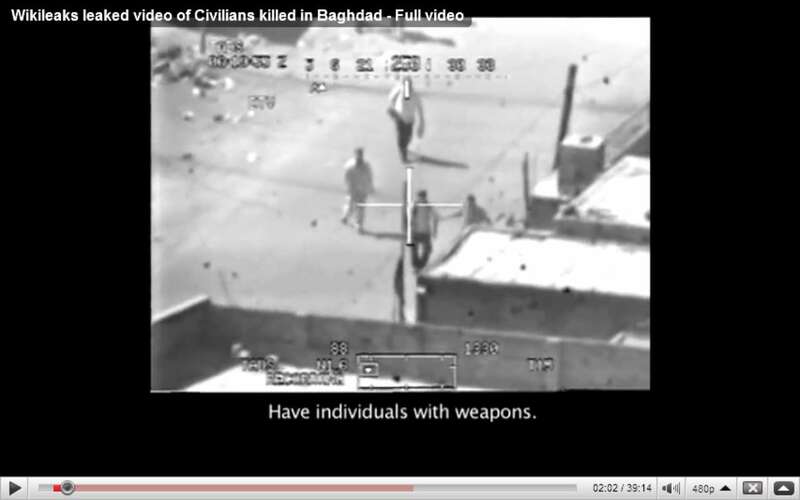 I can't make out an RPG in the next few seconds of the Wikileaks video, either, as those Iraqis move around a little. Loss of clarity in the video transfer from its original form to Youtube format could explain this. In the Army report, the soldiers who were on the scene after the shooting claimed that an RPG launcher was underneath the pile of dead bodies next to the wall. The Army report says this about the black van. As to the presence of the children in the black van, it is obvious from the radio transmissions on the gun-camera tapes that the Apache pilots thought the van was to be used as a means of escape for the wounded insurgents. The van arrives as if on cue, and is immediately joined by two military-aged males who appear from the nearby courtyard. The children are never seen while the driver slides open a door and then retakes his seat while the two other males attempt to load the first insurgent into the vehicle. It is unknown what, if any, connection the van had to the insurgent activity. 1. The Army investigation, which was completed in five days after the engagement, makes no effort to gather any information from Iraqis. All information collected in the inquiry came from US Army personnel who had an incentive to whitewash their actions. 2. The Army report and its supporting exhibits make a strong case that at least two Iraqi males killed in the initial burst of cannon fire were armed insurgents prepared to attack nearby US military forces and vehicles. It does not try to explain what all the other guys were doing. They appear to be nothing more than curiosity seekers. 3. The Iraqis seen in the video seem unaware that the Apache helicopter is monitoring them. An obvious question is, how far away was the helicopter? A reasonable estimate is three quarters of a mile. This is based on the observation that about two seconds elapse between the time the gun camera begins to vibrate (and blur the video image) as rounds are fired and the time at which the rounds strike the Iraqis. Wikipedia states that the M230 30mm cannon used on the Apache has an effective range of 1640 yards (4920 ft) and a muzzle velocity of 2641 ft/sec. If the average velocity of the rounds is 2000 ft/sec, they'll travel 4000 ft (0.76 miles) in two seconds. 4. It will probably never be known why Namir Eldeen and his driver were in the company of Iraqi insurgents. It's possible they were not with them voluntarily. Note how one Iraqi seems to be directing Namir toward the fatal intersection at around 2:00 minutes into the unedited video. I also point out that at 3:15, shortly before the first Apache cannon fire, Saeed is talking on a cellphone and standing apart from the Iraqis huddling close to the intersection. Perhaps the Iraqis, to avoid exposing themselves preparing to attack a US Army vehicle, coerced the Reuters employees to photograph the intersecting street.